Beautifully crafted, energy efficient, secure, and easy to maintain. Wood-grained fiberglass exterior made true to nature with patented AccuGrain technology. Or premium, smooth surface for an upscale, paintable alternative. 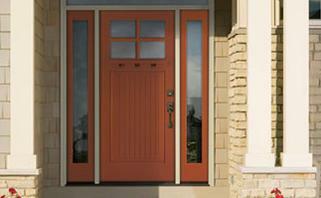 Offers a vast gallery of glass options to maximize the beauty and curb appeal of any entryway. Has five times the insulation value of wood, resists denting and scratching, and won’t rot, deteriorate or rust. Local company that stocks most cabinets in-house and are able to provide fast and easy delivery within just days of purchase. Carries a large selection of kitchen cabinets and bathroom cabinets including base cabinets, wall cabinets, lazy suzans, sink bases, oven cabinets, blind base cabinets, vanities, and more. Made with quality construction, using solid hardwood and wood veneered plywood. Since 1970, Kelleher has been a leader in the moulding and lumber industry. They provide a diverse range of products at affordable prices. Kelleher product lines feature wood mouldings in a variety of species including Pine, Douglas Fir, MDF, Oak, Poplar, Alder, and Redwood. Emtek is dedicated to bringing interesting, well made hardware back into American homes. They opened their doors in 1981 as a manufacturer of speciality hardware and have grown to selling to dealers in all fifty states and across Canada. Emtex offers mulitple lever and knob choices to a variety of authentic materials and finishes, they provide customers with a level of customization that is hard to beat. Insisting on good workmanship has limited the pace of product production, but has lead to a well earned reputation of reliability and integrity of design. Philadelphia Hardware opened in 1985 and has grown to be the largest distributor of EZ Set locks in the country. They offer a variety of hardware selections including residential and commercial locks, hinges, trim hardware, bathroom accessories, and exit devices. Being a local San Diego company, Philadelphia Hardware is able to offer delivery within 3-4 days.